I'm not quite sure how I came across this blog, but I think his work is fantastic! His work is so detailed and a lot of it in metal. It's worth going back to his previous posts as there are lots and lots of photos of how he makes things. 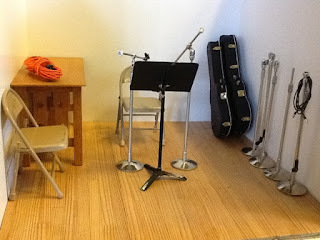 Love his guitar cases, mics and chairs, oh and the tools of course (in an older post). I keep forgetting to take pictures at pottery class. Must do better! There is another class in 2 weeks and I'm hoping some more miniature pots will be fired then. I haven't got time for any other miniatures at the moment as I'm embroidering a RL piano runner for one of my nieces. Her new home is all about 1970s design and colours. She has a beautiful orange sofa and she now has her grandmother's piano (carried up 3 flights of stairs!). The original runner embroidered by my sister was a bit worse for wear. So a new one in orange and brown was in order. The runner will be about 16 cm x 130 cm to cover the keys. It's taking a lot longer than I thought, but am enjoying it! I'm just hoping she'll like it! Hi Idske, je bent er nog ;)!? Wat een werk, zeg om te borduren, je hebt nog een stukkie te gaan, hè? Jij komt dus niet echt aan je eigen miniaturen toe? Ik ben ook flink druk: tuinwerk (onkruid schiet de grond uit nu) en met een paar flinke opdrachten, gelukkig wél mini's en hartstikke leuk om te doen :D! Ben benieuwd naar jouw pottenbakkers kustwerken. Ik ben benieuwd naar de link, die je ons gegeven hebt, zal gauw eens gaan kijken. Thank you so much for sharing this man's blog. From what I can see, he is extremely clever! Reading your post, I remembered back in the 70's, I also had an orange sofa with brown, beige, and orange lamps. Orange was very popular back then! That's when I had my orange craze. I will never again have it in my home but I would wear it because orange is a colour that suits me tremendously. I am also reminded of a magazine that used to come out in the 70's. It was such a fantastic magazine. It contained all sorts of 70's decors and things that we could build for our home. The magazine was cancelled at the end of the 70's era. It was such a fun magazine. I will never forget it. It was called The Apartment Magazine. I'm pretty certain that was the name for it. I just want to add that I tried to leave a comment on his blog but could not because I would have to join that Google plus thing or whatever it's called and I'm not interested. I have enough on my plate as it is with all the blogs I read and comment on and facebook. It's too bad, though. I really would have loved to give him comments to encourage him. That is the way Google will eventually get rid of blogger, I suppose. I started out on blogger so I have both now. It's not that much of a problem if you have a gmail account linked to your blog and the blog won't change at all. I just added the Google+ gadget in the sidebar. New blogs don't have that 'luxury'. If there is anything in particular, I'll pass it on if you like. Thinking about changing technology, last week this is what I heard in our reception class (4 and 5 year olds) when the teacher asked them what something meant, after a short silence from the very attentive group: Well, you google it if you don't know. Idske, thanks for the info but I don't have a blog. I just have a google profile which shows the blogs I follow. I will never join Google+. Never. I hate it that much. When I see this one and that one in somebody's circle, it drives me nuts. Just so much trouble for nothing. If blogger changes to this, I will simply keep all my blogs in my favourites. That is, those that I cannot join with e-mail. I already have many blogs that come to me through e-mail. I just checked this man's blog and he has no comments. If we could reach him through Blogger, I am certain he would have had lots because his work is that superior. Hello Idske! Your piano runner is looking as though it is very Modern and it certainly is in the colors of the 70's! I recall the late 60's and 70's firstly by big Afro Hairstyles and high platform boots! It is funny how through the entire 1900's every decade was so distinctive, and yet NOW everything seems to be so homogenous! Same old, same old ...... I can't imagine that piano being lifted 3 flights of stairs!!!! That will be something for your niece to remember! Thankfully the lifting was done by the removal men and the landings were big enough to stop on. But I don't think she'll consider moving any time soon! The piano runner is a copy of one a friend made for me in the late 70s, when I had everything in black, white and grey, it's grey on a lighter grey. I may be Dutch, but I'm not a fan of orange. I love your embroidery. What a job! What a nice idea to make a piano runner. I'll visit the blog you mentioned soon. The runner looks fantastic - lucky niece.